It’s your friend Tom Jurassic back on Collect Jurassic today – and ahead of New York Toy Fair, I thought we’d touch on some of the things which I really want to see join the Jurassic World line which is currently on offer from Mattel. To get the hype going ahead of NYTF we’re going to split this into two subheadings. Our first, will be “What We Know is Coming” and the second will be “Future Dream Additions”. Without any further ado, let’s get straight into the toy discussion! The first thing is rightly the Colossal Brachiosaurus toy which was first debuted at San Diego Comic Con in 2018. The Brachiosaurus is synonymous with the Jurassic Park franchise – not only being one of the first dinosaurs which we see in the original film, but also being one of the most beautiful giants to appear across all the films. The Brachiosaurus has become a fan favourite – with many people, including my good friend Brad Jost from The Jurassic Park Podcast, having nothing but loved for this long-necked giant. I’m excited to see the scale and scope of this collectable – and am excited to have a piece as large and imposing as Mattel’s already released Mosasaur join the collection for 2019. Following on from the Brachiosaurus, I of course also must touch on the star of Jurassic World – the Indominus Rex. Many fans love the design of the Indominus Rex – and I am one of those people. I love the elongated limbs, the sharp teeth and the deep, red eyes. I love the curvature on the animal, and the heavy reliance upon texture to really give the Indominus its own unique character. Fans have seen their fair share of Indominus toys already – with a wide majority of fans considering Hasbro’s Indominus figures by far some of their best offerings in the otherwise lacklustre offerings for 2015’s Jurassic World line. However, Mattel’s Indominus looks set to blow this out of the water – with high levels of detail, a fantastic amount of articulation and some fun play features incorporated into a robust and accurate design. This is one toy which I am INCREDIBLY excited to own. For anyone who is unfamiliar with me – I absolutely love Toy Photography (Read my Collect Jurassic article on it here). So, I adore the opportunity to get my hands-on action figures which have high levels of articulation, well-detailed accessories and crucially – phenomenal attention to the intricacies of characters. A six-inch collectors line promises this potential – providing the opportunity to give us incredible likenesses, film-accurate accessories and much more. I remember when I first heard rumblings of a collector’s line. I was incredibly excited – knowing that there would be high-end Jurassic products available at a much cheaper price than many of the traditionally more detailed Jurassic products out there. It was an exciting prospect for me – and it is something which I am still excited for to this day. I know a few people are worried that a Collector’s line will mean the core line will not get as much attention – but I think that just doesn’t hold true. The people I have spoken to at Mattel know how popular the 3/34-inch line is so that is not going anywhere and will still get the flagship-level attention that Mattel have given it. The Collector’s Line is just an opportunity for Mattel to try something different – and give us die-hard fans some of our favourite characters in a more intricately created manor. I know news on the collector’s line has been pretty radio silent – so I am hoping NYTF presents the PERFECT opportunity to give us more news on this project! There are, of course, other things to look forward to. We have the Pteranodon coming – which is another fan favourite dinosaur. We also have Franklin coming soon, and new Battle Damage characters like the Plesiosaurus to look forward to. These are all fantastic items – but none speak to me more than the three I’ve listed above in detail! I’m 90% sure that if you’re reading this article, you are going to agree with me on this one as I think all Jurassic fans would! In the original Jurassic Park, we see two incredibly iconic vehicles – the popular Jeep Wrangler, and the equally important Ford Explorer. Both play crucial moments in the film – and the Jeep has seen some incredible renditions from Mattel. We’ve received a slew of Matchbox variants of the Jeep, and we also have the capture-net version, the beautiful Legacy version (Which is incredibly well priced, I’d like to add!) and the wonderfully detailed die cast variant – which has opening doors, and an assortment of small, fine details which really bring the model to life. With all this in mind – it is a shame that we only have the Explorer in Matchbox form thus far! With iconic characters like Grant, Sattler and Malcolm in our collections, I think all fans want to have the Ford Explorer accompanying those characters. I know the community have been particularly vocal about wanting this vehicle to join the 3/34-inch line – so I am hopeful that we will see it in the future. Mattel’s team have done a fantastic job of keeping track of what the community wants – so I have no doubt that we will see this piece of cinematic history make an appearance in one form or another in the future. I’m not the only one who will be saying this – and I want to start by saying I know that if Mattel could release more human figures, they would! Now, however, we know that Franklin is the only new human character due to join our assortments – something which is unfortunate, as I think there is opportunity for a lot more characters. I’d love to, over the coming years, see everything from un-named mercenaries and ACU troopers, to fan favourites like Roland Tembo and John Hammond join the line. Whether these be introduced through the Legacy Collection – or perhaps through vehicle packs like the recent Owen and ATV set – I do not know. I just know that I would love to see Mattel find a medium through which they can introduce more characters in the future, as such a breadth of dinosaurs will undoubtedly need more feeble humans to chow down on! Hands down one of the stand out items in Mattel’s early 2019 line-up has been the Albertosaurus. Fans everywhere have been raving about the fantastic sculpt, articulation and the smart implementation of the two-stage battle damage feature. This is a step-up in terms of the functionality of Mattel’s toys – and is a stand out product. I would absolutely love to see similar dinosaurs of this scale done with this style. Imagine a new Carnotaurus with this feature – or even a dinosaur like the Gorgosaurus done in a similar format. This is a fantastic opportunity to continue to make toys which cool back to Kenner and crucially are packed full of fun features and details, so I hope Mattel keep this as a choice moving forwards. As a side note – Mattel UK team, PLEASE bring this absolute beauty to the UK market. I really want to get my hands on this one! Image via The Fighting 1:18th! Mattel have been doing their larger dinosaurs real justice since the line first debuted. We have had an assortment of fantastic T-Rex Models, alongside a larger-scale Indoraptor and a Spinosaurus model. Now we have seen a large assortment of the creatures which we see on-screen, I would love to see Mattel experiment with some characters which we have not seen before! A Bite N Fight Giganotosaurus, for example, sounds like something which Dinosaur fans would LOVE – and so, I think Mattel could really use the gap between films to experiment with some cool brand new designs. I’m really excited as Mattel have a relatively blank slate – so we could get some truly incredible dinosaurs at all sizes across the next couple of years which I personally find very exciting. That sums up this article – it’s been a lot of fun thinking about what is coming, and what could come! Thanks so much for taking a read of this article. 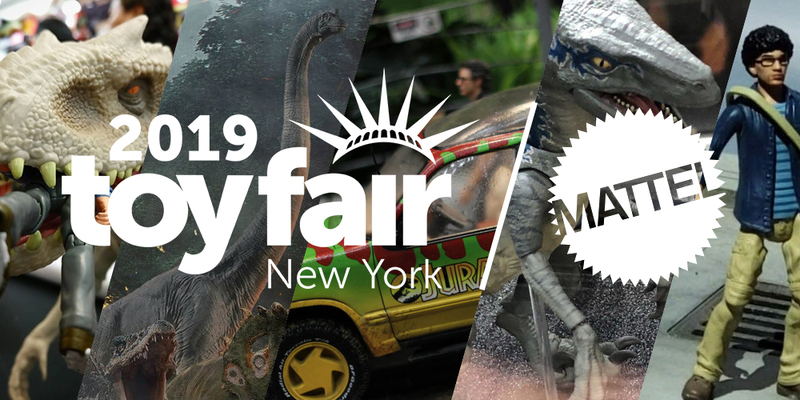 There is lots more I could talk about – but for now, we will look ahead to New York Toy fair, and all of the exciting dinosaur reveals which could be lurking right around the corner. Keep an eye on Collect Jurassic this weekend during the show, where we’ll be posting daily updates on Instagram, Twitter, Facebook, YouTube and here on the website. Enjoyed this article very much and agree with a lot of your choices with what should be in the future. In addition to everything you listed, I also hope we’ll get to see the JW: Evolution assortment of dinosaurs that don’t already have toys to get the toy treatment somewhere down the line (heck, JWE could have a toyline all by itself with the sheer number of dinosaurs in it). Definitely more human figures and it’d be nice to have a variety of mercenaries and ACU soldiers in addition to the few we presently have. A novelverse series with people, dinosaurs, vehicles, etc. taken from Crichton’s two novels could also be very cool. I’m all for more vehicular variety and in addition to the JP Explorer, TLW Mercedes and Humvee, etc. I’d also love to see the raft from the JP ride in toy form. As someone who’s still a big fan of the classic 90s Kenner line, I’d absolutely love to see Mattel attempt something like a Kenner throwback series with toys that are done in the style of the Kenner toys. I’m sure they’d do an awesome job of that. It’d be a fun opportunity for the Mattel designers to really go wild with their imaginations and do something that would’ve fit right in with Kenner’s Jurassic toylines of the 90s, and could even bring back classic 90s toy features like squirting water, glow-in-the-dark toys, etc. With 90s nostalgia being all the rage right now perhaps they’ve got it in mind for the near future. Fantastic ideas, Erik. I’d love to see Kenner throwbacks. I think some of the those then would look fantastic modernised – but I am not sure if the modern toy industry would necessarily support the sale of them unfortunately! With that said, as you say Vintage toys like Ghost Busters, Star Wars, etc. are currently proving popular – so I am sure with the right research, Mattel could sell them to retailers. I also LOVE the idea of more Novel focused toys, and I think as you’ve mentioned, lots of the toys in Jurassic World: Evolution really lend themselves to toys. A Hybrid series based on the game could be very cool. And as for more toys – the Mercedes and Humvee would be cool! If you’re looking for a good 1/18 scale Humvee then World Peacekeepers offer some good fill-ins. Thanks so much for reading the article and leaving a comment, Erik. Really appreciate you taking the time to do so! Thanks, glad you like my ideas. I think a Kenner throwback series would probably do pretty well, with both the big fanbase Jurassic has and the Kenner toys still being beloved by many now grown-up 90s kids who fondly remember the Kenner era. Vintage-style toys for other toylines as you said like with Star Wars and Ghostbusters seem to sell pretty well, and I think Jurassic would more likely than not sell well (there’s also the Kenner-style action figures NECA has done for their Horror/Sci-Fi licenses such as Alien and Predator). Plus it’d add some nice variety to the main line at retailers. I miss those crazy and fun action features many 90s toys of the time had like squirting water, glow in the dark, water-activated color change, etc. it’d be fun to see Mattel implement those. In the novels it’s amazing how many dinosaurs there are that have yet to feature in any of the films, such as the Hypsilophodon, which would make for a most welcome and fresh addition to the Mattel series. It’d be a nice way to bring the toyline full circle in a way with how much of Kenner’s first series was heavily based upon the original novel. I too would love to see more dinosaurs taken from the games, between JWE as well as the 2011 Telltale game with the Troodons. Heck, you could have a Gameverse series with particular dinosaurs and other creatures taken from some of the games. And the mention of Ghostbusters reminded me how fun it’d be to get a series of humans perhaps influenced by Ghostbusters, call it something like Dinobusters. Which would actually fit right in with the 90s-themed Kenner throwback series and be a nice nod to the Dino Trackers toyline of JP Series 2. You could really give the human figures of this line some fun gear like net launchers, water-spraying weapons, capture traps, etc. I think it’d be fun to see Mattel attempt something like that. Mattel made tons of great dinosaurs and other prehistoric animals but an underwhelming number of human figures, so something like a Dinobusters line with an emphasis on human characters outfitted to track down the dinosaurs could and would be very cool to see, IMO. I think with the figures you describe, there is definitely scope in the 6 inch collectors line. I personally hope that characters like Owen come with a wide range of diverse accessories – like those current Diamond Select Ghostbusters figures. Imagine if Owen, for example, came based on his Jurassic World appearance. He could include a removable knife, removable cargo jacket (So you can have him in either his full apparel or just the henley shirt), in addition to his lever-action rifle and also the multi-shot tranquilliser rifle he utilised on main street. A lot of scope for a fun, authentic figure. Plus, you could then throw in a ‘capture’ accessory to add that Kenner flair to the product. I hope we get a JW Owen figure with both his Marlin rifle and the rapid-firing tranq rifle, perhaps Mattel has it planned for a future release down the line? I’m sure we’ll eventually get it among others, especially with a two-year wait for the next film so Mattel will be looking for ways to tide fans and collectors over until the next film and it’s toyline. I wouldn’t be surprised if some of the Mattel crew who’ve worked on the Jurassic toys also grew up as fans of the Kenner line, so I’m sure they’d have fun doing a Kenner-style throwback line. I don’t know if it was an intentional nod, but I noticed right away how the Velociraptor in Wave 2 of the Fallen Kingdom assortment looked an awful lot like the electronic Velociraptor released during the first series of the Kenner line. It wouldn’t surprise me at all if it was a deliberate homage. The more I think about it the more it’d be awesome to see something like a Dinobusters line and one can only hope it’s been circling around Mattel’s offices. There’s so much they could do with something like that and not just with the human characters and their gear but also things like vehicles and playsets. Mattel so far has given us some cool vehicles but there’s definitely room for more variety in that department, and sadly playsets are where they fell just a little short (although given they were under pressure to get the toys out in time for JWFK’s release last year it’s understandable if they didn’t have much time to focus on that). How cool would it be to get new Kenner-style playsets along the lines of the JP Command Compound and TLW Mobile Lab Trailers? It would be epic to get those larger playsets but for now it all depends on retailers. We need to continue to support these toys – and show retailers that they are worth stocking! I’d like to see more of the iconic classic Ford Explorers, Mercedes Benz,and Jeep Wrangler Jeep 12 ,Lex, Tim, Henry Wu, Dennis Nedry, and John Hammond Figures for the legacy JP and JW toy line. Not to mention Claire Dearin, Mr. Mezroni, Hawkins, and ACU Unit Figures. Mattel’s got want it takes to make these. I believe they can. I know they can… Mattel has found a way…lol!! But are you aware of Fisher price’s fantastic imaginext Jurassic world line aimed at younger kids but also popular with mini fig collectors? They have some great new stuff coming up for release in 2019. Hoping to see some more previews via toy fair. Thanks so much for taking the time to comment. I was aware of the line in 2018 – I know my good friend Brad Jost from The Jurassic Park Podcast has been enjoying them with his son! I wasn’t aware they were bringing out more in 2019 however, so that is fantastic to hear! Do you know if more Classic products are on the horizon?